(Boalsburg, PA) - One year, a classical guitarist came from Spain just to play at this annual event. Another year, a couple came all the way from France to attend. Guests regularly attend from up and down the east coast and from as far away as California. But this isn’t some well-publicized Penn State event that is attracting so much international attention. Instead, it’s the Boalsburg Heritage Festival, a weekend celebrating many generations of American heritage in Boalsburg as well as a unique local connection with Christopher Columbus. And yet many local people are unaware of it. “In previous years, the Boalsburg Heritage weekend has competed with Penn State’s homecoming activities, but not so this year,” says Christopher Lee, President of the Boalsburg Village Conservancy which is sponsoring the weekend. This year, event organizers are rescheduling to the weekend of October 5, when the Penn State football team is away, so locals are free to join the international guests. The weekend begins with the Columbus Ball at 7:30 pm on Saturday, October 5, at the Boal Mansion. “Those who attend have been raving about this event for decades, saying it’s the best party they’ve been to in their lives,” says Lee. Guests sip champagne, enjoy abundant hors d’oeuvres from local restaurants – enough to constitute dinner– and contra-dance to the music of Bruce Young’s combo, Smashing Windows. The evening event benefits historic preservation and celebrates Boalsburg’s unique-in-the-nation connection with Christopher Columbus. 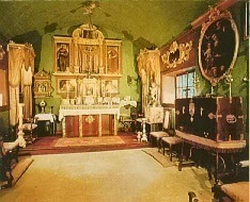 The famous explorer is an ancestor of the Boal family and the Columbus Chapel, including the Admiral’s Desk that belonged to Columbus, were inherited by the Boal family and imported to Boalsburg from Spain in 1909. In the middle of the evening, chairs will be set up in the ballroom and a parade of historical characters will present the local heritage and its national and international connections. And the heritage on display is extensive. Lee’s cousin Alan Boal, a retired broadcaster from Pittsburgh, will don pioneer garb to portray the pioneer David Boal (1764-1837) whose 1804 tavern served as the nucleus for the village of Boalsburg when it was founded in 1809. Another cousin, John Irvin Thompson IV, a local keyboardist known as JT Blues, will portray his ancestor Moses Thompson (1810-1891), a founder of Penn State and owner of the Centre Furnace Mansion. Lee himself will narrate the pageant of historical characters and portray his great-grandfather Theodore Davis Boal (1867-1938), the founder of the Boal Troop and the 28th Division Shrine in the World War I era. Musician Bruce Young will don 15th century period dress to portray Christopher Columbus (1451-1506). Other guests will portray a diverse array of historical characters included signer of the Declaration of Independence Richard Henry Lee (1732-1794) and beloved Boalsburg historian Ruth Corter (1907-1997). On Sunday, the characters will assemble again in the village square for the free Boalsburg Heritage Festival between Noon and 4 pm. Joining them will be local musicians John “JT Blues” Thompson, harmonica virtuoso Richard Sleigh and traditional American guitarist and violinist Bruce Young. A very popular feature of the Sunday festival is free wagon rides with a historical guide through the village and down to the Boal Mansion and Columbus Chapel. Sites along the route include the Boalsburg Heritage Museum, Boal Hall -- home of the Boalsburg Fire Company -- the Boalsburg Cemetery, birthplace of the national holiday of Memorial Day, and the Columbus Chapel and Boal Mansion Museum, where guided tours will be available starting at Noon. The Sunday afternoon festival will also include crafts booths and tables displaying local heritage.